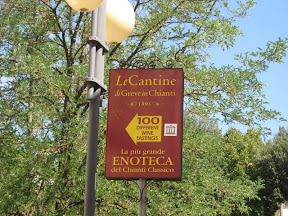 On Saturday I boarded a packed bus to the little village of Greve in Chianti for a day of wine tasting. 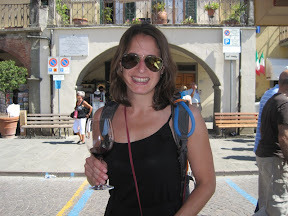 I had a full agenda planned: check out the Chianti Classico Wine Festival and explore Italian wines at Le Cantina. 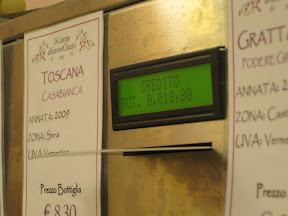 I arrived from Florence in about an hour by SITA bus for about six euros (round trip cost). Not a bad deal. The most difficult part for me was actually finding the bus station. It’s on the opposite side of the train station around a corner. My first order of business upon arrival was to locate Le Cantina. It’s an underground cave that features wines from all over Italy with a focus on Chianti — given the location it really made the most sense. The way it works is quite simple. You pay for a cash card, then meander about the cave plugging your card into a dispenser and about a two ounce pour streams into your glass. They have over a 100 different types of wines to sample. 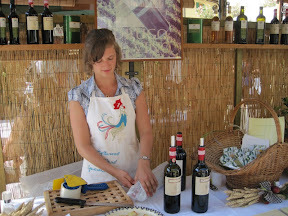 You can also try salami, cheese and olive oils. I read that the festival can sell out of wine glasses, so I opted to take a quick peak of the wine cave first, then hit the festival, which was staged in the main piazza. I love how the festival works. You buy a glass, which you keep, then hit up the various booths and sip. The wine glass comes with a map of the wine producers and a punch card. Apparently you are only supposed to have about five tastings or so, but the cards were only punched if you asked for it. Needless to say, not a lot of people were making the request. Since I was tasting at both the festival and the cave I did a lot of dumping. It was a really hot day and I knew I wouldn’t survive otherwise. Most of the folks seemed to understand my plight, but apparently I greatly upset one woman who grabbed her heart like I had personally hurt her by pouring the wine into the dump bucket. She refused me anymore, then insisted on punching my card. Ouch! I asked producers their favorite wines and went to those booths. 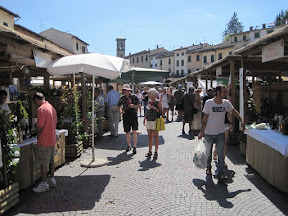 It was a great ploy as I ended up finding a very good Chianti Classico and an amazing peppery olive oil. From there I wandered back to the cave where I loaded up my card and started on my merry way. I began with whites and a sparkling. Then, made my way to the red wines. 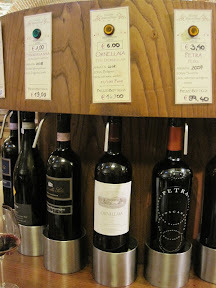 I tried everything from eight euro bottles to 170 euro bottles. The tastes range from .60 euros up to five! I think I have a decent knowledge of wine, but I was incredibly intimidated walking around the cave. I had no clue what to try. 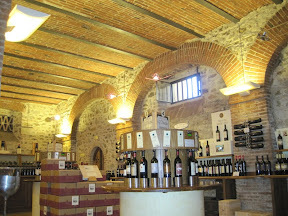 There were wines from all over Italy, all over Tuscany, rosso, bianco, sparkling, dessert — it was a bit overwhelming. I had read that they will do personal wine tastings if you ask, so I did. I was told no by an unengaged worker. Trying desperately to get some direction I asked her favorite. I was told, “everyone’s palate is different.” Um, gee, thanks for that. Not exactly the lesson I wanted. I heard her say those exact same words to another patron not an hour later. It was very disappointing. 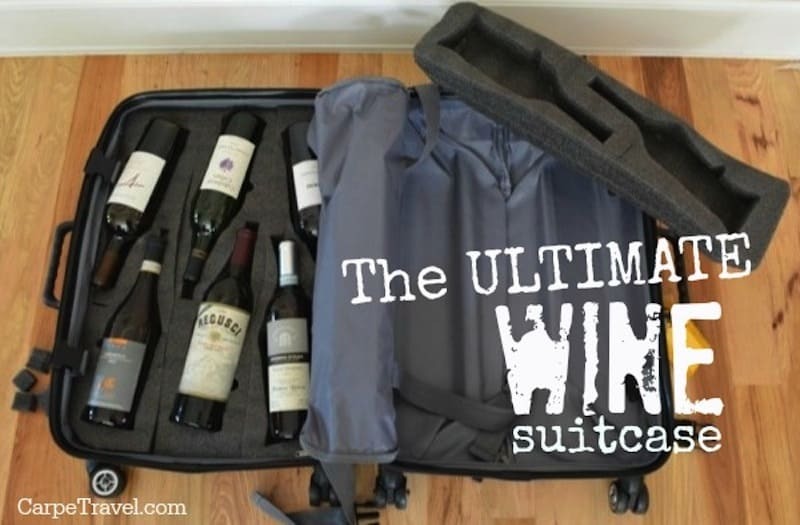 For a wine lover like me, the cave was like a world of wonder, but I didn’t know how to tap into it without more direction. I started taking mental notes of ways to give more to the customers and new revenue streams for Le Cantina. Why not offer personalized tasting tours for a fee? I’d certainly do it. Require folks to make reservations in advance (credit card required, natch) and charge for the tour. They could set up various packages that fit different price points. With this, Le Cantina can plan ahead for staffing needs, patrons can explore wines based on their tastes with a personalized guide and they make more money. I mean really, everyone wins. Further, I think they should let customers keep the branded tasting glass. It’s a fun little souvenir that will get folks talking about the cave when they are home. Really, the possibilities are endless with a gem like Le Cantina, but maybe they could just start with more welcoming staff. Don’t just shut people down when they ask for direction. The bad taste lingers like corked wine. All in all, I can say my wine day was a great experience. Next stop: San Gimignano and the little farmhouse. Ciao Ciao!